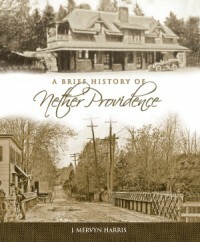 Compiled by Merv Harris and published by the Nether Providence Historical Society, the book traces the history of Nether Providence from its pre-colonial days, through its transition from farming community to suburb. Join us for the book’s release on Monday, November 29th at 7:00 pm at the Helen Kate Furness Free Library. Books will be available for purchase and Merv will be on hand to sign your copy. If you can’t make it to the event, the books will be on sale at Furness Library and at Nether Providence Township Building. UPDATE: More than 80 copies were sold tonight at Furness Library, where the line for Merv’s signature wrapped around the Reference Room. Copies are on sale now at the Township Building and at Furness Library.